Two new metro stations in Poland! New metro station. BTWT photo. Two more Metro stations opened in Poland in December. They are not part Warsaw’s proposed metro line 2. So where are they? Here is a clue. One of them is situated in a tunnel built sometime in the 1970s. Still guessing? Read on. Poland is riddled with old tunnels. Wawel Castle has a secret escape tunnel. In the middle ages merchants living in towns along the River San built extensive cellars under their houses to store their merchandise and provide escape routes in times of danger. During WWII, Hitler had an extensive network of tunnels built using slave labour in the Owl Mountains. After World War II the Poles started building an East – West metro under the River Vistula. Poles have a love affair with their tunnels. They are the very essence of myth and legend – a dragon lived under Wawel Castle; the German’s were working on an anti-gravity device under the Owl Mountains; the costs of the tunnel under the Vistula bankrupted original efforts to build the Warsaw Metro, but everybody knows somebody who actually walked through it to cross under the river. Even Polish railways have their underground romances. Wroclaw Railway Station is said to have a twin, directly underneath the original. A complete train loaded with treasure looted by the Nazis resides in a blocked off tunnel that lead to Hitler’s nuclear bunker under Furstenstein (Zamek Ksiaz). And Cracow has had a metro station since the 1970s! The Cracow Metro project dates back to 1956, when the local party bosses, not wanting to be outdone by their Warsaw colleagues, came up with a plan to connect Cracow to the new satellite town of Nowa Huta with a metro line running from East to West. The idea made little economic sense – a reserved track inter-urban tram line running through the open countryside already connected the two centres. However, the idea of a Cracow Metro refused to die completely and when the rebuilding of Krakow Glowny railway station commenced in the 1970s space was left under the railway tracks for a road tunnel and metro station. In the 1990s it was decided to utilise the metro tunnel for the Krakowski Szybki Tramwaj (KST) (literally Krakow Fast Tram) a semi metro, combining aspects of both tramway and metro practice, running North-South (see map below). The KST was built in fits and starts; construction was not helped by the original contractor going out of business half-way through the contract. The first section from Kurdanow to ul Wieliczka was opened in 2,000, the second section incorporating two new underground stations, Krakow Glowny and Polytechika, opened on 11 December last year. Interestingly, the Cracovians are not calling their tram tunnel part of a ‘semi-metro’, but rather part of a ‘pre-metro’, so it looks as if the idea of one day building a Cracow Metro has not yet completely been abandoned! Don’t miss tomorrow’s exciting instalment – BTWT’s intrepid reporter goes to Cracow to investigate! This entry was posted on Thursday, 2 April 2009 at 08:30 and is filed under Cracow. You can follow any responses to this entry through the RSS 2.0 feed. You can leave a response, or trackback from your own site. They aren’t “metro” – subway stations. 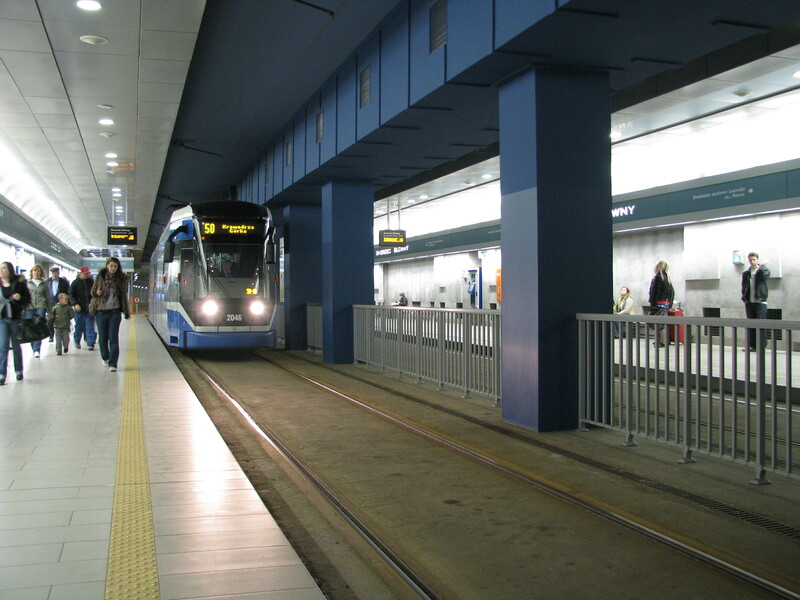 This is fragment of KST line which has stops in the tram tunnel.